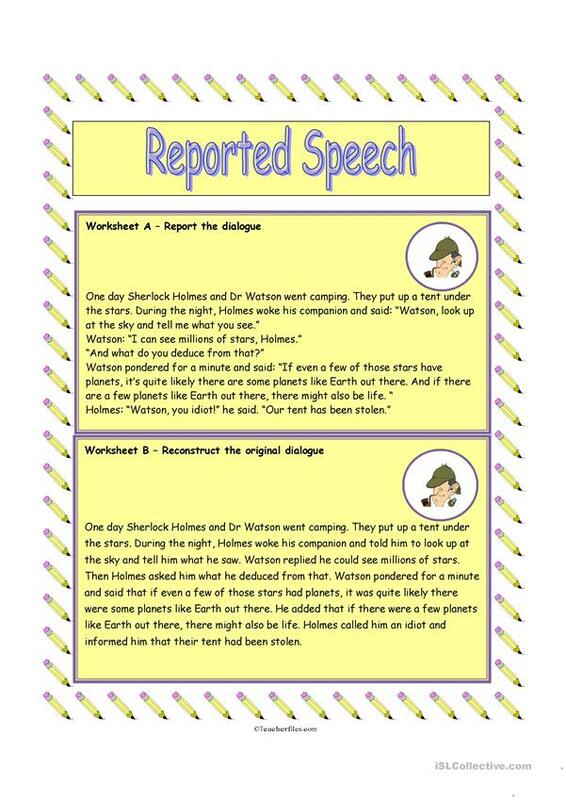 Two worksheets for practising transforming direct into reported speech and vice versa. Distribute worksheet A to one half of the class (they should report the dialogue in their notebooks) and worksheet B to the other half (they should reconstruct the original dialogue). When they have completed the task, ask them to swap worksheets and check the results. The above downloadable printable is intended for high school students and adults at Intermediate (B1) level. It is a useful material for practising Reported Speech (Indirect speech) in English, and is excellent for developing your students' Reading and Writing skills. It focuses on the vocabulary topic of Humor. It includes the solutions, too.